Why use the Die Casting Process? The aluminum die casting process makes component parts, decorative trim, and finished products. The die casting process used by Kinetic Die Casting Company offers many features, advantages and benefits to those who specify this manufacturing process. The die casting process provides complex metallic shapes within closer tolerances than any other mass production processes. 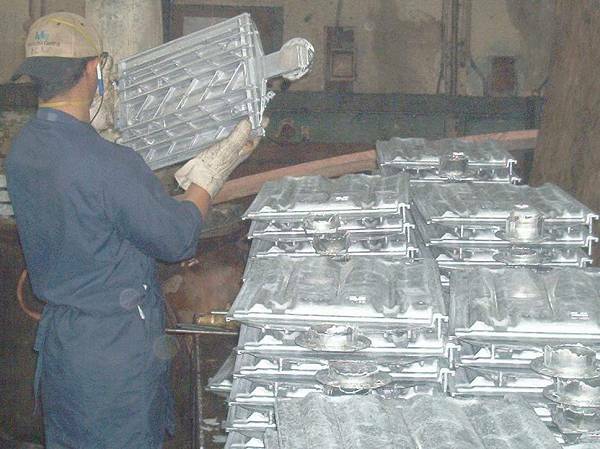 Die castings are processed at very high rates of production. Near net shape is archived so little or no machining is required. Parts produced using the die casting process can be produced with thinner walls than those obtainable by other casting methods. Parts produced using the die casting process are much stronger than plastic injection moldings with the same dimensions. Parts produced using the die casting process are durable, dimensionally stable, and have the strength, feel, and appearance of quality. Die casting dies can produce tens of thousands of identical castings within specified tolerances before additional tooling may be required. In parts produced using the die casting process, aluminum castings can be painted with a minimum of surface preparation. Parts produced using the die casting process can be produced with surfaces simulating a wide variety of textures. Parts produced using the die casting process, "as cast", are smoother than virtually all other forms of casting. External threads on parts produced using the die casting process can be readily die cast. Parts produced using the die casting process provide integral fastening elements, such as bosses and studs, which can result in assembly economies. Inserts of other metals and some non-metals can be die cast in place with high pullout strength. Threre are different aluminum alloys for different uses. Corrosion resistance of parts produced using the die casting process rates from good to high. Die castings are monolithic. They combine many functions in one complex shaped part. Strength is that of the material, not that of the threads, welds, etc. Compare Die Casting Alloys, this chart describes the similarities of the various die casting metals. Kinetic Die Casting Company Monthly Newsletter Signup. Parts produced using the die casting process is a fast, efficient, and economical process which, when used to its maximum potential, replaces assemblies of a variety of parts produced by various manufacturing processes at significant savings in cost and labor.